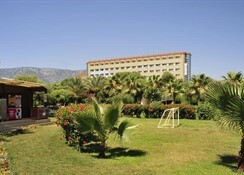 For a relaxing holiday with close proximity to the beach the Dinler Hotels – Alanya is ideal. This all inclusive resort offers a high level of service to ensure guests have a fabulous stay. With a great variety of cuisines and beverages available, plenty to keep guests entertained, and comfortable and stylish rooms at the Dinler Hotels – Alanya this hotel should be perfect for couples and families. 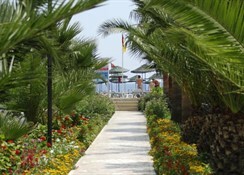 The outdoor pool and sun terrace are great for enjoying the Turkish sunshine. Children also have their own pool and are well looked after with a mini-club offered to keep them both occupied and amused. Adults can utilise the Spa and beauty facilities at the hotel where numerous treatments and services are available. 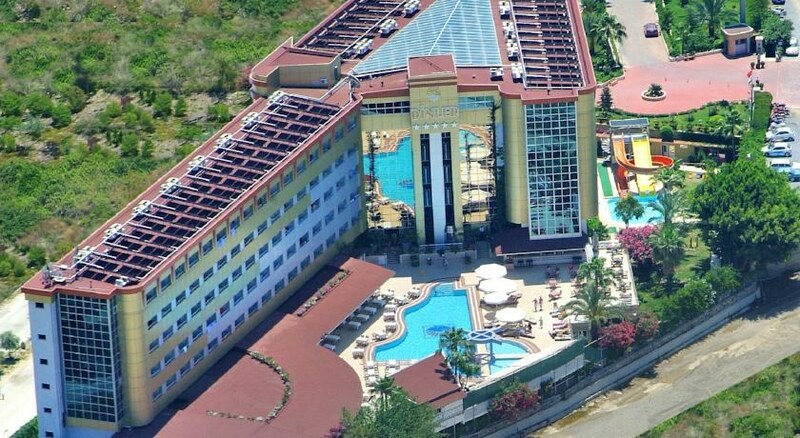 Set in the town of Kargicak, Alanya in the Turkish Riviera the Dinler Hotels – Alanya is found beside the main coastal road which separates it from the nearby Mediterranean beach. Inland the hotel is backed by the imposing Taurus mountains in the distance. Just a few minutes’ walk away through the gardens is the hotel’s private beach where sun loungers and shades can be found together with a small pier. The Plumeria Mall is just two minutes’ walk away. Antalya airport is 87 miles away via the coastal route, along which a number of championship standard golf courses available to the public can be found. The 215 guest rooms at the Dinler Hotels – Alanya offer guests a level of comfort and style that should ensure they enjoy their holiday. Featuring a décor with soft rich tones, the rooms are all furnished to a high standard and include TV, minibar, air conditioning, direct dial telephones, 24-hour room service, WC and bath, Wi-Fi and in-room safe. They also benefit from a daily house-keeping service. The Comfort Rooms contain one double bed and one singe bed as do the Family Rooms although rollaway / extra beds or cribs can be requested. Views from the rooms are of the Mediterranean Sea or Taurus mountains. 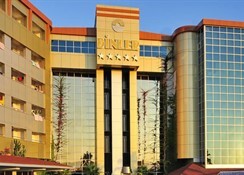 The Dinler Hotels – Alanya profits from several restaurants which provide guests with a plentiful and varied fare. The on-site Syedra, Teras and Alaiye restaurants supply guests with a buffet breakfast, lunch and dinner served in convivial surroundings with both indoor and alfresco dining. 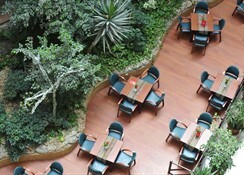 The Sari and Yesil restaurants offer an à la carte service specialising in Turkish and world cuisines. For those with a lighter appetite beverages and snacks can be obtained from the beach, pool, disco and lobby bars and the patisserie. The food and beverages provided on-site are included in the all-inclusive package although some restrictions may apply. 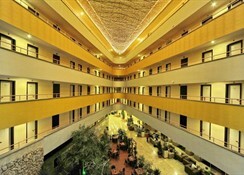 There’s a multitude of activities and pursuits to both relax and entertain guests at the Dinler Hotels – Alanya. The outdoor pool features two water slides and is surrounded by a sun terrace. For children, there’s a separate outdoor pool. A heated indoor pool is also available on a seasonal basis. Sporting options available to guests include billiards, table tennis, darts, table football, tennis, a fitness centre and, at the private beach, volleyball and watersports. Other services include a TV area and shops as well as the spa and beauty facilities which offer massage, sauna, jacuzzi and Turkish bath treatments. For those wishing to party at night the hotel has its own nightclub and DJ. Premium items are excluded from the all-inclusive package. Some spa and beauty treatments incur an additional cost.